Closing Crawl Space Vents in the Winter - Good or Bad Idea? | News and Events for Basement Systems, Inc.
Home»About Us»Blog»Closing Crawl Space Vents in the Winter - Good or Bad Idea? Homeowners across the nation need to start thinking about their crawl spaces when winter comes. Most crawl spaces house pipes, ducts, or other appliances, and no one wants to come home to frozen or burst pipes. In short, you should do everything in your power to keep the cold air out. However, this doesn't mean that closing the vents is the solution to all of your winter crawl space concerns. There is a better answer - sealing your entire crawl space against Mother Nature's wrath. Why take this measure? Ventilating your crawl space has been proven not to work. Although the original intent was for the air from outside to dry out the crawl space, in actuality, the moisture or extreme temperatures brought in do more harm than good. And closed crawl space vents is not enough - the elements, as well as insects and other pests, can still get in. Install a vent cover. 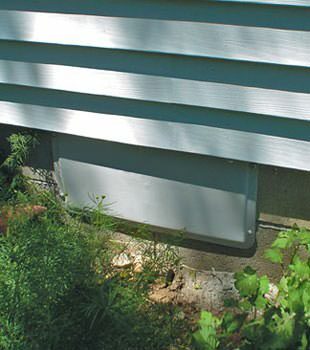 Because crawl space vents offer no value to a home, it's best to cover them up. CleanSpace provides a vent cover that attaches mechanically to form an airtight bond. Seal the crawl space. Installing a vapor barrier will entirely seal and encapsulate your crawl space. This prevents moisture from entering the space, therefore stopping mold growth, and will keep out pests as well. Insulate. Not only will crawl space insulation help maintain the temperature around any pipes, but it will also keep the floors above warmer. If your crawl space has fiberglass batts, it's time to switch them out for a more moisture-resistant option.